Canadian Anti-Spam Law (CASL) compliance tips for businesses, charities, and not-for-profits when you have limited time and resources. Since the announcement of CASL on July 1, 2014, businesses were given a three-year grace period to allow all parties the opportunity to learn about the law and have policies and procedures in place to become compliant. To help reduce spam and protect privacy, the Canadian Government developed the CASL legislation where organizations need to ensure that they have implied or express consent when sending commercial electronic messages (CEM) to an electronic address in Canada. A CEM is a message whose purpose is to encourage participation in a commercial activity, such as to purchase something or visit a website. An electronic address can be an email address, phone account (SMS text), instant messaging account, or something similar. The Phase 2 of CASL includes consent to install software on a computer or device. According to the news release issued by the Government of Canada on June 7, 2017, provisions that were scheduled to come into force on July 1, 2017, have now been suspended; however, a suspension doesn't mean it is going away. "Canadians deserve an effective law that protects them from spam and other electronic threats that lead to harassment, identity theft and fraud. At the same time, Canadian businesses, charities and non-profit groups should not have to bear the burden of unnecessary red tape and costs to comply with the legislation." Many small business owners and not-for-profits that are run solely by volunteers, find themselves overwhelmed by red-tape and paperwork. Even though many of us understand personally how frustrating SPAM can be, full compliance to CASL is just one more challenge organizations face in an already time-challenged environment. What can organizations do to be CASL compliant and still manage tight time and budget restrictions? Use a third-party software, such as MailChimp or Constant Contact, to send emails. These programs make it easy to manage the recording of consent and unsubscribe lists. Add a subscribe to my email list on your website. Give people a reason to join, such as writing blog articles that are interesting and relevant to your audience. Just ask! When at a networking event mention what you do. If they are interested, ask them to join to stay in touch. Ask people for a referral. Once you have their email address and make the connection, ask them for express consent to add them to your list. When people sign up for an event, have an opt-in box added to the registration form where they can check if interested in receiving emails from your organization. Start recording all "consent to receive emails" verbal and electronic. Using a basic EXCEL or GOOGLE DOCS sheet is a good way to start. Familiarize yourself with the Canadian Anti-Spam letter of the law. Note: The tips in this blog are meant to be guidelines only. 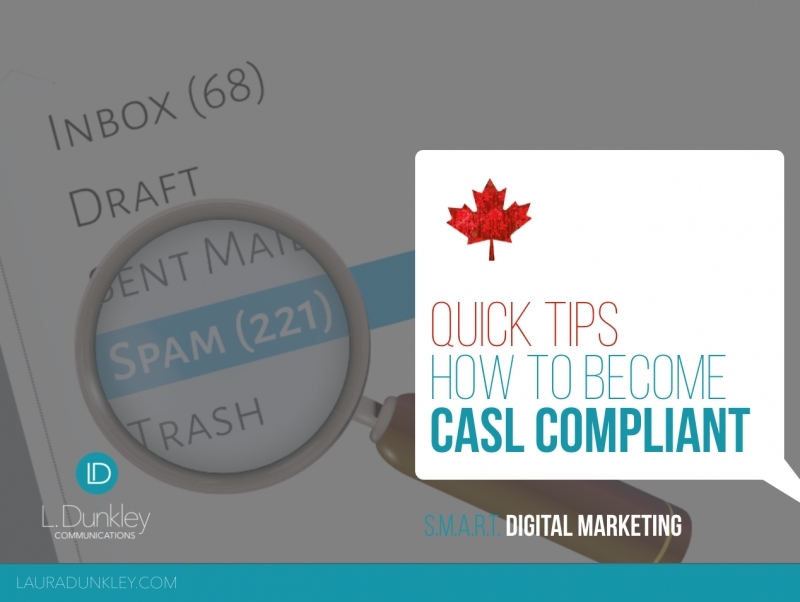 To understand how to be fully compliant, it is important to read and understand the CASL legislation as outlined on the Government of Canada website above.